You are here: Home / Damp / Where do all these damp and timber treatment solutions come from? Can they be relied upon? 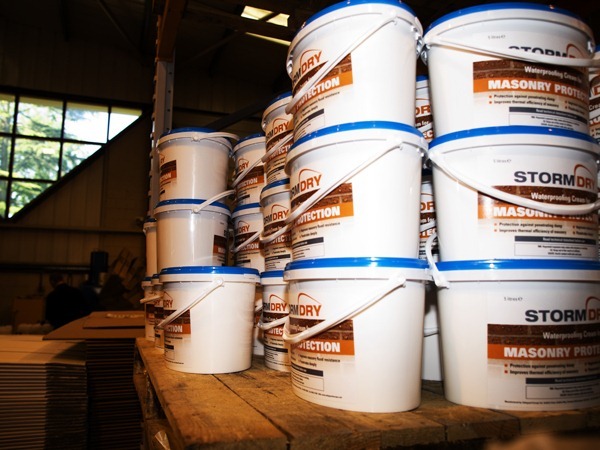 Where do all these damp and timber treatment solutions come from? Can they be relied upon? It’s all very well specialist damp-proofing contractors making promises, to solve damp problems and eliminate timber infestations. The thing is though, on what facts are these promises based on? 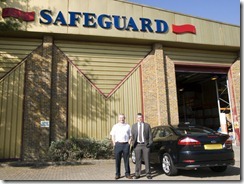 To find out, I spent a couple of days at Safeguard Europe’s UK headquarters in Horsham Sussex. I found the semi-industrial unit on a none descript office, come industrial park, looking at first glance like any other distribution centre; A frontage of first floor office spaces, over a large high-racked storage unit. The reception has a few glass display cases showing Safeguard’s products and the awards they’ve won over the years. What interested me though, lay buried away behind all this. First Surprise: Row after row of brick walls, constructed in the unit and sat in trays of salty water. Second: Piers, built on concrete slabs, some plastered and rendered, some naked brick. All with a core of sand, saturated with the same salt solution. Dr Eric Rirsch, Safeguard’s head of product development and testing explained what was going on here. These walls and piers are more complicated than they look. 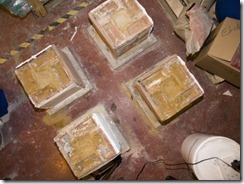 Eric has constructed these from a wide variety of mortar types, designed to mimic ‘old’ construction. Mainly lime based and weak cement based materials. 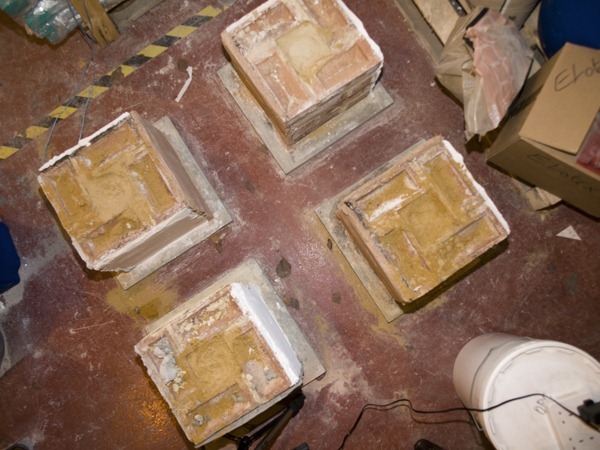 The salt solution is made up to an agreed standard, which enables measurements of damp sorption and salt build up in the wall and piers, to be measured. Damp rises up through the pores in the mortar and bricks; Eric’s job is to stop this rising damp. The lengths Eric goes to are impressive. 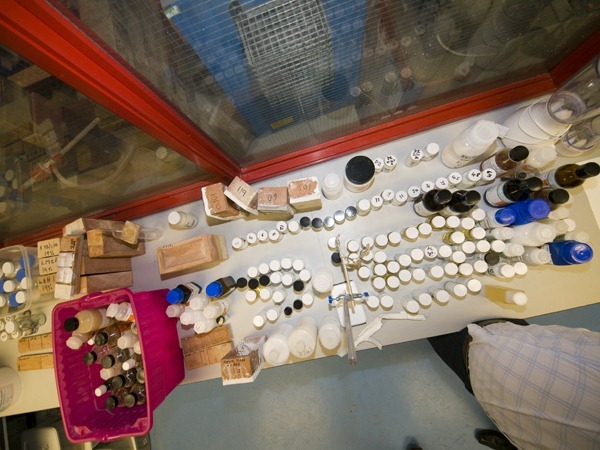 long term testing of capillary and hygroscopic moisture content is carried out. 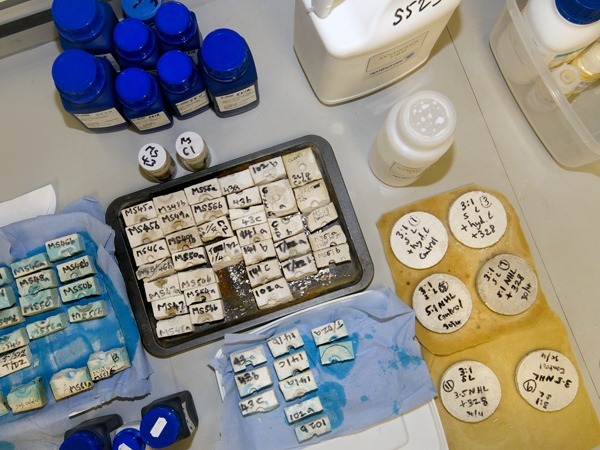 Chemical analysis, computer analysis and electron microscopy is used to check how things progress and react to Safeguard’s rising damp treatments. And time lapse photography is used to check the all important visual evidence – after all, that is what the homeowner measures success by. The third surprise was the lab facilities. 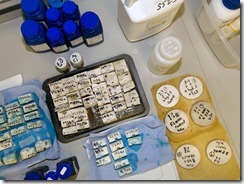 used to carry out all this testing and refine and formulate appropriate remedial treatments. Any lab will have the microscopes, ovens, reactors, scales and rigs seen here. 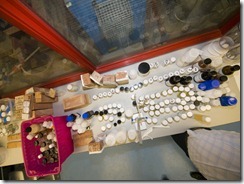 What was an eye opener for me though, was just how many samples are being tested and recorded at any one time. 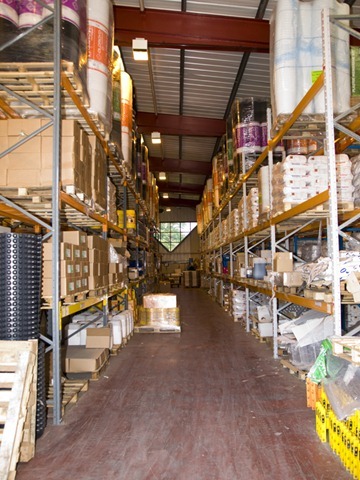 Racks and shelves are in abundance, treated with one or another of hundreds of damp-proofing formulations, each being carefully compared over time. Eric pointed out what a fine balance all this is. Getting things not only to work, but also to stay stable and not coagulate or separate, getting the material to perform in different mortars, bricks and stone. 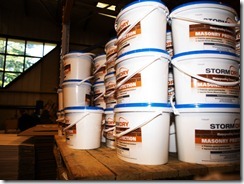 Doing all this whilst not causing unforeseen long term problems, and keeping the product affordable and practical too. 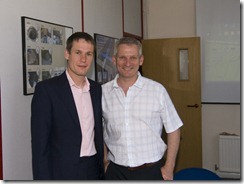 Safeguard’s MD Hudson Lambert was on hand and is clearly immensely proud of the work being done here. 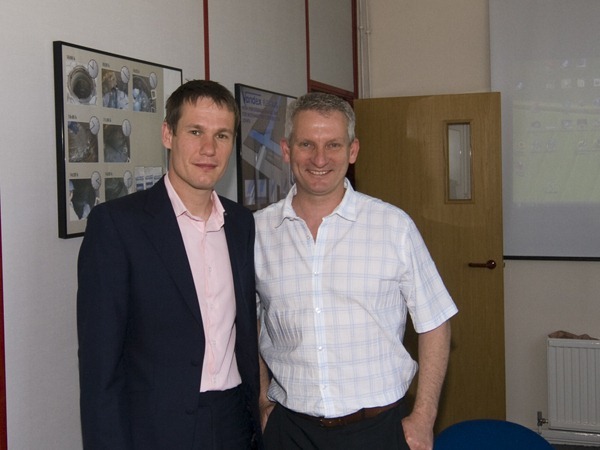 Over the two days, he and his staff ran through several presentations for me in the board room, ranging from their DryZone damp-proofing cream to the new StormDry water repellent cream range, flood remediation and protection, plus the Oldroyd and Vandex tanking ranges. It was clear though, that the real pride is in the products Safeguard formulate themselves and I was really pleased to see such enthusiasm from everyone I met there. 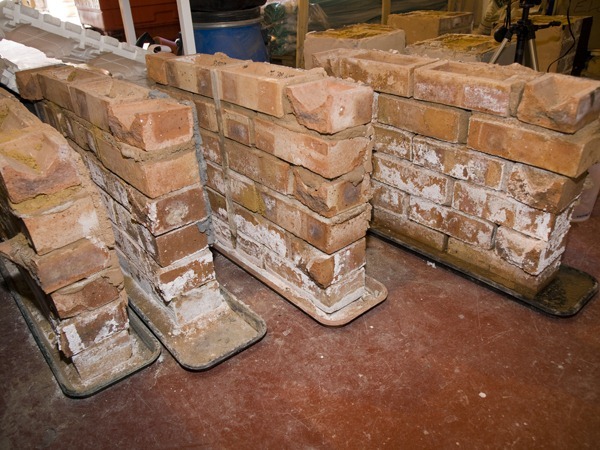 Eric ran through his new paper “Rising Damp in Masonry Walls and the Importance of Mortar Properties” http://bit.ly/ds9AS9 which was fascinating. I was a bit chuffed too, because Eric’s scientifically rigorous work agreed with some of my own opinions, which are based on anecdotal observations and thoughts, over the last 33 years. Phew, what a relief that was. I can honsetly say that had Eric told me that what I believed happened in walls as damp rises was wrong, I would have to accept it. The evidence based research he has done is incontrovertible. So this is where I get the damp-proofing, waterproofing and timber treatment products I use from. 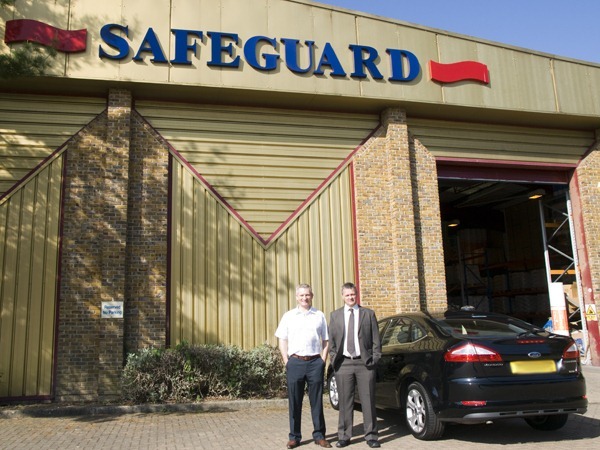 There are other suppliers, but I’ve yet to find any to match the level of knowledge and real enthusiasm for doing things right, which is apparent at Safeguard. This is commendable; they deserve to prosper.